The ability to hold your place with a forefinger or bookmark while quickly flipping around the pages of a book is one of the few functional advantages paper books have over ebooks - or rather, it was. On Tuesday Amazon introduced a new navigation feature for Kindle platform called Page Flip. 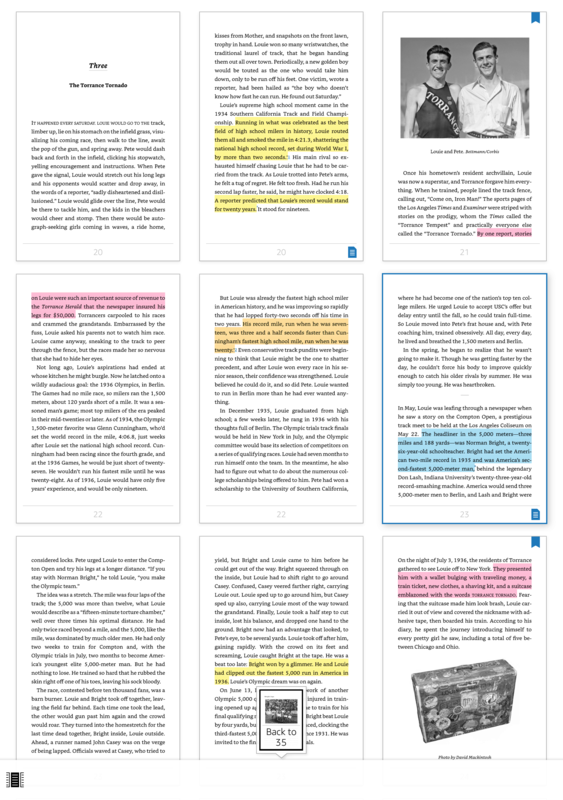 With Page Flip, readers can easily flip back and forth between pages in an ebook to reference different parts of the book while they read. Their original location will be saved, enabling them to quickly jump to the back of a book to check a map or glossary and then return to the story. As any Kindle user could tell you, the Kindle platform already had a feature like this where you could flip through a comic book. Also, the Kindle ereader already let you push the page you're reading to the background and flip around inside a book, but the new Page Flip feature improves upon that feature. As you can see in the GIF, the bottom menu bar has a scroll bar and two buttons for the two different flipping features. The one on the left is for the old feature, while the button on the right is for Page Flip. You can find more info at Amazon. Amazon is rolling Page Flip out to all its apps in the next few weeks, and it will be coming to the Paperwhite, 2014 basic Kindle, Voyage, and Oasis as a firmware update. From what Amazon is saying on its site, this is a feature of the Kindle ebook format, and not a software feature. So it won't work with sideloaded ebooks right away, nor even with all ebooks sold in the Kindle store. They’ve had this on Kindle for years. The only difference is that you couldn’t see 9 pages at once, you could only see 1 at once. On the Kindle basic this would be wasted because you can’t read anything on any of those 9 pages due to the lack of resolution. The default of one page at a time works fine for the basic, but I know it won’t matter. The current firmware was clearly designed for the 300 ppi readers and painfully forced onto the basic. Some of the menu options are nearly illegible, and the font text in ebooks show significant aliasing (not present in the Kindle 3 or 4). But even on the 300 ppi readers I seriously question how useful it is to have screen previews 1 in or less in width. The best solution came way way before the page flip feature (including the original one) which is just search for what you want and then hit back to go back to where you were. People were averse to using the search function before because, out of ignorance, they were afraid of losing their place. They’ve had this on Kindle for years. Yep. I mentioned that in the post. Yeah I noticed that, I’m glad that you pointed it out because I’m sure that alot of other sites won’t! Potentially a very useful feature. Out of curiosity I checked the last ten Kindle books I purchased (all from major publishers) and nine of them had Page Flip enabled. I rarely used the old Page Flip feature that shows only page, maybe adding eight more pages will help it become more useful. It is too bad it only works on certain ebooks. I mostly use page flip when I want to go forward and backward a chapter at a time. I blogged about it back in 2014, and that post just got a lot of hits today as this new (but not newly-named) feature came out. I hope this doesn’t require publishers to do something special because if so, it’s not likely to be widely available. The x-ray feature is really great in certain kinds of books, but a lot of publishers don’t bother with it. Very frustrating! I’ll have to do a new page flip post and update the old one so people find the new info. I missed that launch way back when, although I did know about the previous feature. This is in hope of finally opening up the textbook market for September. In studies, the lack of college students (among others) ada/o/pting to etextbooks is because they miss the ease of flipability of the traditional paper text. This would represent multi millions, even billions for Amazon. It has been a tough market for them to crack. Checked my guess: as far as I can see, all books with Page Flip enabled are KFX-Format on my Kindle. When I download a book I bought some time ago (a year or two) I get some other format, and often a few days later the book gets updated to KFX – like “someone is using the book, we convert it to KFX”. Another guess is, that unlike for X-Ray the publisher does not have to do anything, it is a process which gets applied to a) new books and b) books that are downloaded again and thus marked as used to be processed. KFX format cannot be stripped from DRM with ALF’s Toolset for now. But not all books with KFX do have DRM. And you can download the older format from amazon.com/myk to transfer via USB, that can be stripped – but also does not have page flip nor the new typesetting.